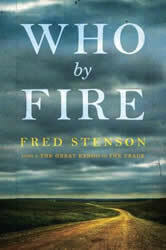 Who By Fire is a novel that is hooked pretty securely to my life story, though I am not the character Bill Ryder nor are his family members my family members. This is more than the standard disclaimer at the beginning of a novel; it is true. Many of the things that happen to the Ryders in Who By Fire, the out-of-control sulphur plant, the livestock deaths, the illnesses, did happen to the Stensons, and were the subject of an air pollution law suit in the 1960s (settled out of court in the 1970s). But the characters are fictional, and I’ll tell you why. One of the things I’ve learned to be wary of as a fiction writer is a protagonist, or any character really, who is too directly selected from life. An awkwardness occurs almost instantly, and too often fatally. The writer is suddenly handling the character either like a piece of glass or like a tree stump; that is, the writer won’t let the character crash or fail to the degree that is needed, or the opposite: the writer hacks the character to pieces as if to prove in court a lack of bias. Either way, the falseness weighs heavily on the work. The other reason for not following my own community’s story line, not using my family members as characters, was that I wanted to get at something more tragic. We did have the losses I describe but, because my community (like the one called Dry Fork in the novel) did get together on a law suit which did produce an eventual settlement, there was a measure of satisfaction and dignity in our story. I know there had to be families out there who suffered similar things without any comfort, but in an unrelenting loneliness. That state was what I wanted for Who By Fire, a kind of burden that can’t be shifted or lifted and must be harboured within and dealt with there. That is the story of Tom and Ella Ryder and their children. I also have my memory to go on, and, though I was very young, I do remember some incredible times, mainly at night. The scene that I render as the novel’s prologue is a memory: the night lit like day, the vibration of the bed and floor, the violent roar.